President Armen Sarkissian had a phone conversation with the President of the Republic of Kazakhstan Kasim-Zhomart Tokaev and congratulated him on assuming that position. 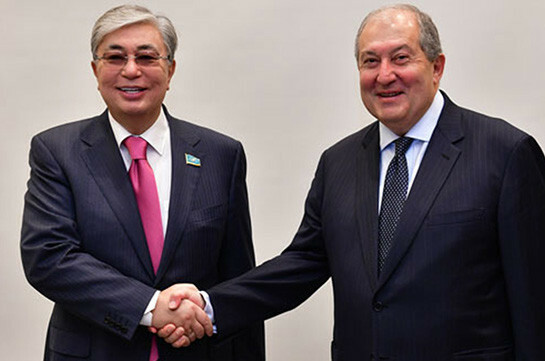 President Armen Sarkissian expressed confidence that the existing traditions of friendship and mutual respect between the two nations would continue to serve as a solid foundation for the development and deepening of a mutually beneficial cooperation between Armenia and Kazakhstan. President Sarkissian wished President Tokaev good health and success as well as peace and prosperity to the friendly people of Kazakhstan. President Armen Sarkissian sent also a congratulatory message to Kasim-Zhorat Tokaev on assuming the post of the President of Kazakhstan. “I am confident that through the joint efforts, we will be able to give a new impetus to increasing the efficiency of the interstate cooperation between our countries” reads the message of the President of Armenia.